Which Should I Buy (or Should I Build One)? 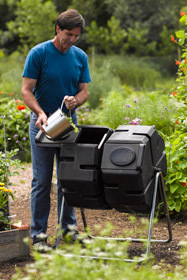 This article reviews all sorts of compost bins, from the in-at-the-top, out-at-the-bottom kind, to compost tumblers, to DIY compost bins. They do not all work the same, and there are advantages and disadvantages to each. Which one you buy (or build) depends on how much space you have, how much compost you want to create, and how much work you want to put in. In batch composting, kitchen scraps and dry leaves are added to a bin until it's full, and then nothing more is added so that it can all finish breaking down, which may take 2-3 months. With big accessible batch bins, the compost should be turned a couple of times over the course of 2-3 months, to give it air, re-mix the contents, and keep it from smelling. 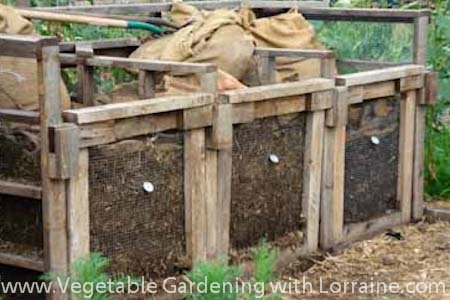 This is the best way to generate a lot of compost for big gardens, or if you eat a LOT of vegetables and want to compost all the scraps. In batch composting, you really need at least 2 bins so that one can be active (where you add new stuff) and one can be closed (where nothing new is added so it can finish decomposing). Most wooden bins and compost tumblers work this way. In a top-to-bottom composter, kitchen scraps and yard waste are continually added to the top of the bin, and finished compost is scooped out of a little door at the bottom. The new stuff is always on top, pushing the older and more decomposed stuff toward the bottom. Most molded plastic compost bins work this way. This is a slower process because the contents in the middle of the bin are hard to access for turning and aeration and therefore are slower to break down. 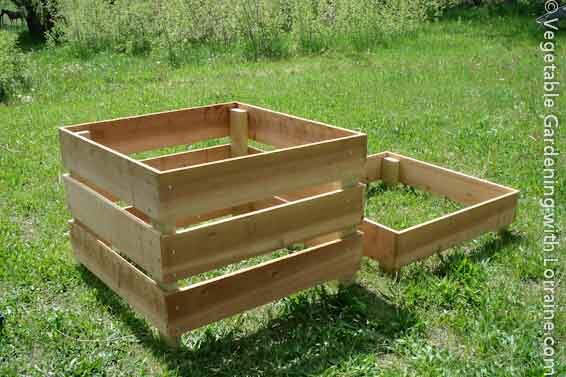 These types of compost bins won't make a lot of compost quickly, but on the other hand they require almost no effort! They will make enough compost to supply most patio, container, or other small gardens. 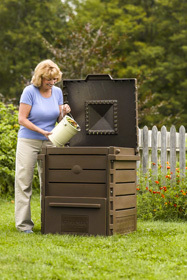 Worm bins are fun and create awesome nutrient-rich worm castings for your garden. They work very differently than ordinary compost bins (which get too hot for worms), and they take up very little space. They are especially fun for families with kids (or grownups with a kid inside them)! The worm composting process is covered in more detail in the article on Worm Composting. 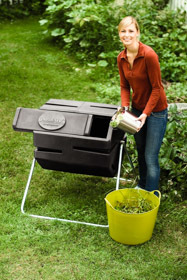 The sturdiest and best of the top-to-bottom composters, with good capacity. To make larger quantities of compost, buy two: one for 'active' and one for 'finishing'. This bin is the best bin I've ever used. It works so well because it is made of stacking tiers, which you can move over as you go to turn the compost. I keep em' crankin' year 'round, one taking the fresh scraps and leaves (which I store in a separate bin, for mixing with the kitchen scaps), and one closed and 'finishing'. I make a LOT of compost in these. Free Plans Here. Compost tumblers are all batch composters. They are designed to turn and mix the contents, and turn out small batches of compost relatively quickly if the recipe is properly balanced. Avoid the kind that flip end-for-end, like the ones in the photo on the right. Compost is very heavy, and the strain on the stand when these things flip is intense, almost dangerous. They are very hard to turn if they are more than about a quarter full. I actually wouldn't recommend any of the large tumblers that are up on a stand, even those that rotate sideways - they are just too heavy to turn when they get much in them. I see many of these "donated" to the community gardens, sitting abandoned off in a corner. Dual-batch compost tumblers which have two, smaller-volume tumblers side-by-side on the same stand. They have two advantages: 1) when one side is about 3/4 full, you can stop adding stuff to it so that it all has a chance to finish breaking down, and start adding the fresh stuff to the other side. 2) they are small enough that they never get too heavy to rotate. Roller compost tumblers sit on a roller on the ground, which supports the weight so that you can really push on them to rotate them. There is no stand to topple over or buckle. The left two photographs above are roller tumblers. Compost tumblers work well for smaller quantities of compost, and they excel at keeping out even determined dogs and other critters. Top-to-bottom composters take waste in at the top and dispense finished compost out of the bottom. The cheaper ones are flimsy but the better ones are sturdy and durable, and will last for many years. Despite their large size, they are relatively slow to produce compost. This is because the contents are hard to access, which makes it difficult to turn and aerate the compost, which would speed decomposition. They produce several shovelfuls of compost every few months out the little door at the bottom. 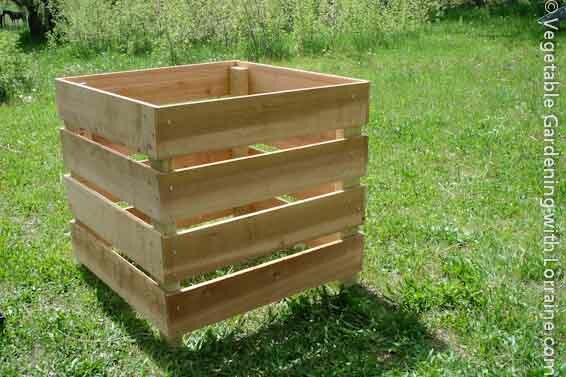 Two people can usually lift a plastic, top-to-bottom style composter up and overthe compost, leaving the compost in place on the ground. Set the bin down next to the pile, and then fork the pile back into the bin in its new location. As you do this you will be aerating and mixing the contents, and can make any adjustments needed to the moisture level or carbon/nitrogen balance as needed. There are many different designs of these, but they are virtually all home built. I have tried out most of them over the years. By far and away the best bin I have ever used is the one in the center above, which is made up of 4 stacking tiers. (Free plans here.) These are square frames made of 1" x 6" cedar fencing cut to 28" lengths from Home Depot, held together at the corners by little short 2x4 legs. The legs are 7 1/2" long, and are screwed on so that they are recessed an inch at the top and protrude 2 1/2" at the bottom. The effect of this is that when you stack one tier on top of the next, they nestle onto one another and kind of "lock" together, while leaving a nice 1 1/2" gap between tiers around the sides for good aeration. 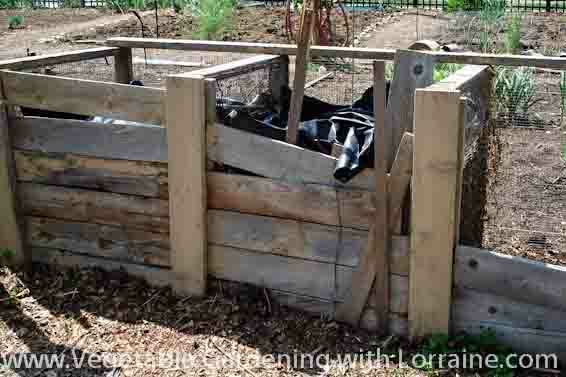 In use, the brilliance of this homemade compost bin design is that it is so easy when you go to turn the compost! You simply lift off the top tier and set it on the ground next to the bin and start forking the compost over into it. As the pile gets lower in the original bin, you move over the next tier, and fork some more compost over, and then move the next tier, etc. As the original pile gets lower and lower the new one gets higher and higher, until the whole pile is fluffed and inverted, right next to where you started. Wire bins are cheap, adaptable, and actually work wonderfully if modified slightly. If you are going to use it to actually make compost rather than as a leaf bin, wrap the sides partially in plastic to preserve moisture and nutrients, otherwise they are too airy. There are some square designs on the market with corners that are held together by vertical hingepins, and these work well. I have also made them out of 36" high 2x4" mesh wire (aka "sheep fencing"). 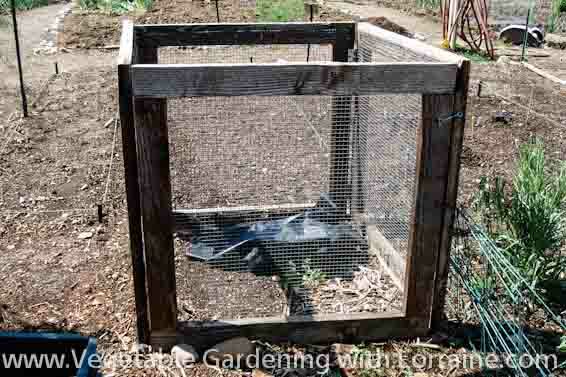 Try to avoid 4x4" inch mesh if possible, as the spaces are too big and scraps and leaves will fall out the sides. The one shown here has a wooden frame, and is hinged on one side for ease of cleaning out the last bit when you get down to the bottom. Nothing is better than a wire bin for leaves, and it is a great idea to have both a compost bin and a leaf bin. This is so that you have access to a ready supply of high carbon material (leaves) to mix in layers with the high nitrogen kitchen scraps and grass clippings you generate throughout the season.